I am admirer of the work put out by Disney, despite not always admiring the company itself. Their penchant for retelling the same stories time and time again admittedly gets old, and their recent attempts to remake and retell their animated films in live action, complete without songs, did not sit well with me. This isn’t the first time they’ve done this – they did the same thing back in the ‘90s when they did live action versions of The Jungle Book and the briefly franchised 101 Dalmatians and its sequel, the obviously named 102 Dalmatians, which… at least they got Glenn Close to come back? Anyway, I was not particularly looking forward to Cinderella – a retelling of a tired story which, to be quite honest, provided us with one of Disney’s lesser animated films back in the day – especially after the massive disappointment that was the atrocious Maleficent last year seemingly proved this whole thing was just one big cash grab, motivated by the money Tim Burton’s also-atrocious Alice in Wonderland made. When the trailers came out, the ones with actual actors and not just a spinning glass slipper, I didn’t even like the look of the film. So, no, I was not looking forward to the new and needless Cinderella, 2015 edition. Funny thing about timeless tales, though, is that they can always be retold and, depending on who’s telling it, they can actually be made interesting or at least enjoyable once again. When positive reviews came flooding in for this film, I was intrigued and found myself raising the bar on my lowered expectations. 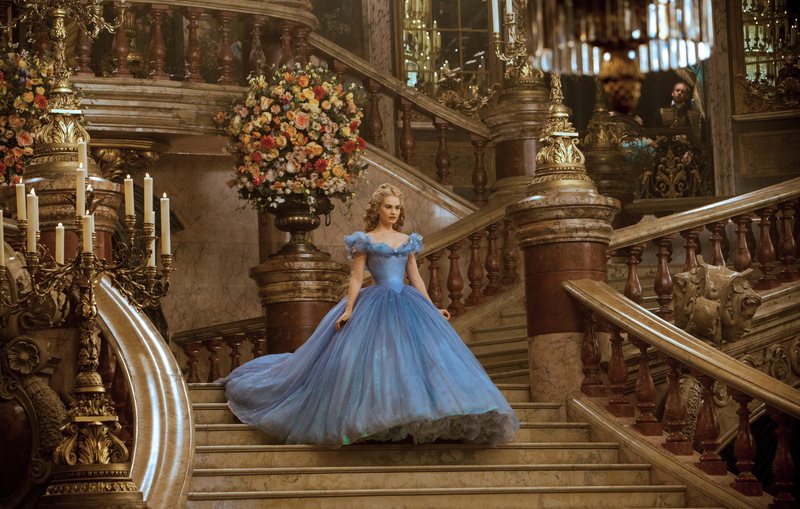 Critics love the new Cinderella, and they even praised the art direction, too! So I decided I’d go see it. I probably was going to, regardless of the buzz, but at least this time I had something to look forward to, and it wasn’t just the cute Frozen short, Frozen Fever, that played before the film. The overall plot doesn’t deviate much from the commonly known tale, particularly as depicted in the 1950 Disney film. Your basic story developments are as follows: Cinderella falls under the control of a wicked stepmother and two stepsisters who treat her poorly and care not for her family’s legacy or kindness toward them, but, one day, her Fairy Godmother turns up and provides her with a means of going to the ball, where she and the prince dance all night until she leaves at midnight, inadvertently leaving behind a glass slipper which he uses to identify and then marry her out of every woman in the kingdom. And they all live happily ever after. Kenneth Branagh and screenwriter Chris Weitz, however, have made notable, significant changes. Gone are the songs, which are reduced to mere references and credits music, and gone are the talking animals, which have been devolved from wearing clothing and having merely human-like personalities. (They’re actually cuter that way, anyway, trust me – Jack and Gus’ mouse slang always got on my nerves after a while in the original.) Her relationship with the prince, here nicknamed “Kit,” begins earlier on in the story, and the prince is also given his own subplot which works in tandem with Cinderella’s to make the two a lot more well-rounded and their romance all the more believable. It’s no longer founded on mere destiny and wish fulfillment but rather two people who admire each other’s character and not merely their good looks. And that is the biggest change from the original animated film. Comparisons have been made to superhero films, in fact, with kindness essentially being Cinderella’s superpower. We get to meet Cinderella’s actual mother, the woman responsible for instilling in her the value of kindness, even towards those who do not show it back. Before her untimely (but inevitable) death, her loving mother serves as a sort of Uncle Ben to Cinderella’s Peter Parker, and so we actually understand the reasons why Cinderella found herself a slave to her stepmother and stepsisters: it’s both a blessing and a curse, and a power that can leave one vulnerable but strong in character. To contrast with this, the villains and how they enter Cinderella’s life are also given more context. 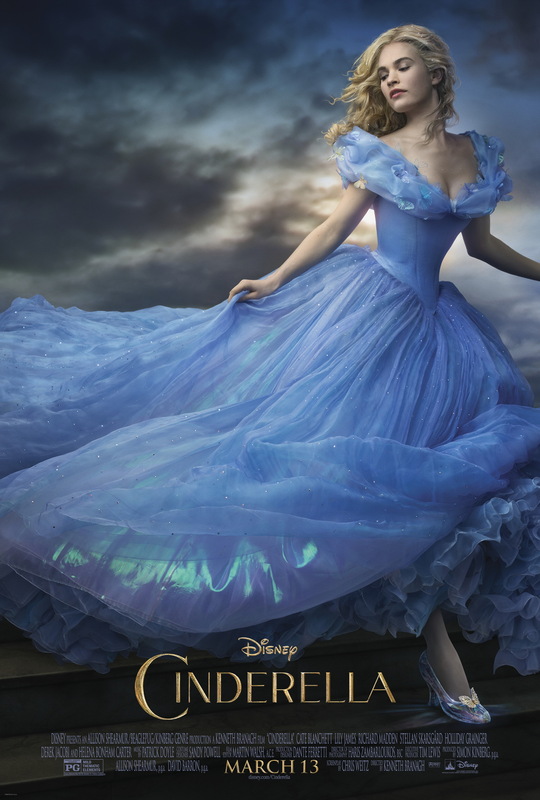 The film shows that their cruelty and selfishness is also powerful but the result of weak character, selfishness, and insecurity, which Cinderella overcomes – even her magical transformation here is dependent upon her strength of character. Some of the tweaks in the final act that reinforce this aspect really set this film apart from its animated predecessor and, quite possibly, also sets this film above it – but never trampling all over it, either, as was the case with the abhorrent Maleficent. I seriously wasn’t expecting much from this film. If the general consensus was even to be mostly positive, I would have expected it to be only by a slight margin. I didn’t like the look of the film in the trailers, and I didn’t even know what to expect from the performances – perhaps a few bland heroes and some overly campy villains. I also didn’t see the point in retelling this story, particularly from Disney, except for the fact that it was an easily bankable film that relied upon brand recognition. I’m happy to say, however, that I ended up thoroughly enjoying the film and the subtle ways in which it subverted my expectations without abandoning the Disney formula entirely. In the context of the film as a whole, it turns out that the production design is beautiful, colorful and opulent throughout, and I’m certain that anyone who enjoys costumes and fashion will fawn over this film, too. 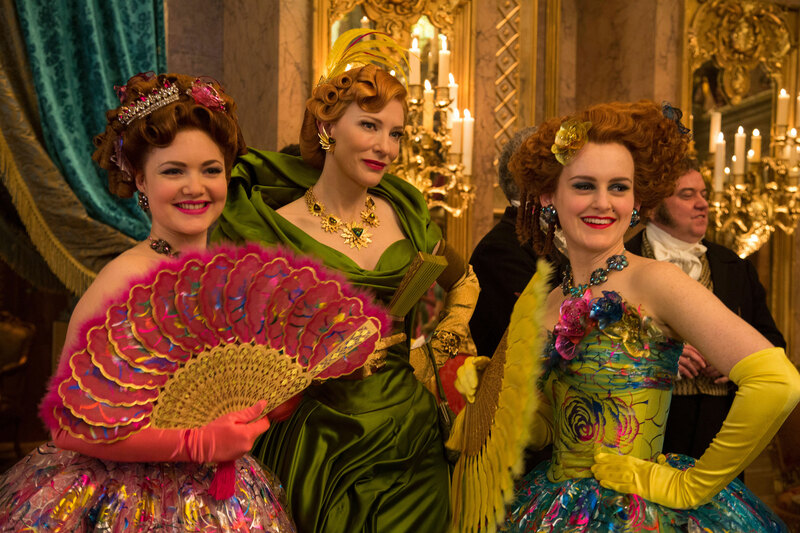 The performances were thoroughly great, from Lily James as a charming, sweet, and dignified Cinderella to Cate Blanchett as the waspy, cruel, but secretly tragic Lady Tremaine. 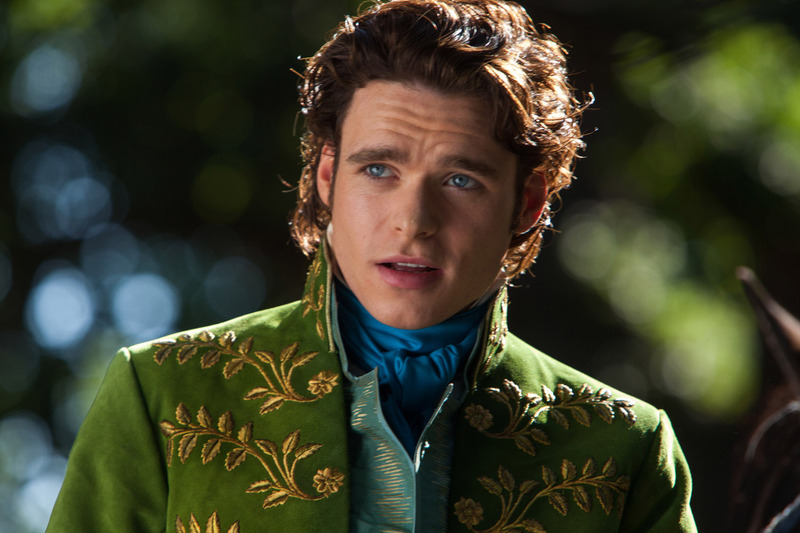 Heck, even Richard Madden as the previously personality-free prince ends up being an endearing counterpart to our lead. Did I miss the songs? Sure – they were the best part about the original production – but I ultimately didn’t need them, either. This was, however, what Disney needed to prove that perhaps their recent slate of live action remakes don’t have to merely be the cash-grabs we expected. I’m certain we’re going to get some more duds – Tim Burton is still directing that live action/CGI-hybrid Dumbo remake, after all – but at least this film exists as a very high benchmark for which to judge them.